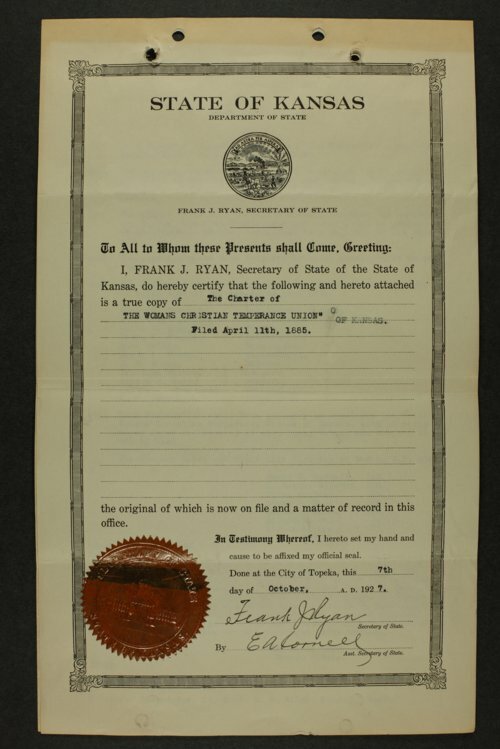 These permanent records of the Kansas Woman's Christian Temperance Union include the records of the treasurer, contracts concerning publications, sworn statements of elected trustees, correspondence with potential speakers, candidate information relating to prohibition laws in Kansas, and meeting minutes. There is also correspondence concerning the Kellogg-Briand Pact, an international peace agreement signed in 1928. One letter clearly disapproves of Maude Royden, an English suffragist, from fulfilling her presentation for the Y.W.C.A on account of her tobacco use. A copy of the charter of the Woman's Christian Temperance Union of Kansas, signed by Secretary of State Frank J. Ryan is also included. There are several other groups of official Kansas WCTU records on Kansas Memory. They can be found by selecting Collections - Manuscript - KWCTU/Mary Evelyn Dobbs.